Innovation patents are unique to Australia and provide a quicker and less expensive means of protecting inventions. The innovation patent is designed to protect those inventions that are not sufficiently inventive to meet the inventive threshold required for a standard patent. The innovation patent requires that the invention be a manner of manufacture, new, and “innovative”, which requires that the invention claimed differs from the prior art so as to “substantially contribute to the working” of the invention. When do I need an Innovation Patent? you wish to obtain a patent quickly with minimal financial outlay. An innovation patent is suitable for protecting inventions with a short commercial life, as it is less expensive than a standard patent and it is not examined until after grant. Unlike standard patents, an innovation patent only undergoes a formalities check prior to grant, to ensure that the application is in order, and all the necessary documents have been provided. Therefore, an advantage is that it is possible to have a granted patent, to act as a deterrent to potential infringers who want to use your invention, without incurring the costs for examination until it is necessary to do so. However, as there is no check for validity of the patent before it is granted, the value of an innovation patent may be more difficult to determine. An innovation patent cannot be enforced until after it has undergone examination and the patent has been certified by the Australian Patent Office. 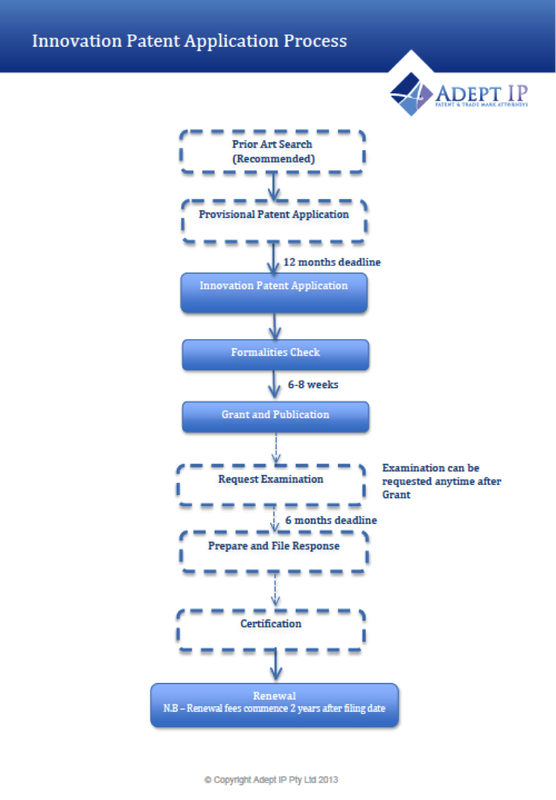 Examination may be requested at any time after grant by the patentee or a third party. If the examination is successful, the patent will be certified and the patentee will be able to enforce the patent in the same manner as a standard patent. The innovation patent will then remain in duration for a period of 8 years, during which renewal fees will be required to be paid annually, beginning 2 years from the date of filing the innovation application, in order to maintain the patent. Please do not hesitate to contact us for further information regarding innovation patents.